When Is Thomas Jefferson's Birthday 2019? The birthday of Thomas Jefferson, who was the United States' third president, is an annual national legal observance on April 13 . He was the principal author of the U.S. Declaration of Independence and is known as one of the country's founding fathers. 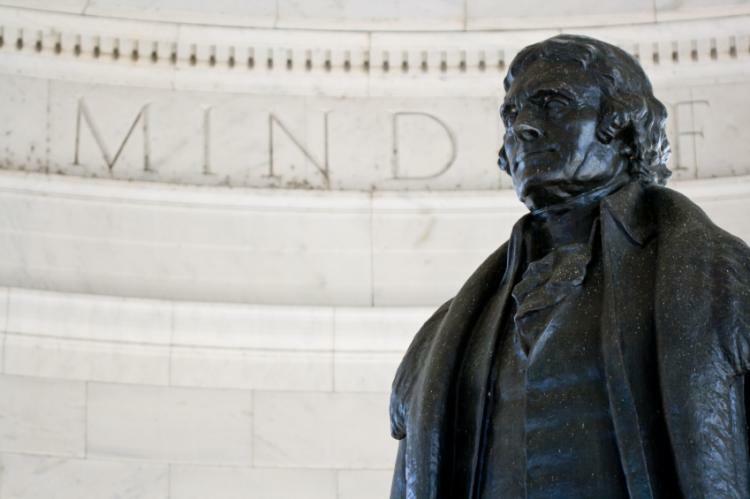 Is Thomas Jefferson's Birthday a Public Holiday? Thomas Jefferson's Birthday is not a public holiday. It falls on Saturday, April 13, 2019 and most businesses follow regular Saturday opening hours in the United States. Thomas Jefferson, the man who drafted the U.S. Declaration of Independence. Thomas Jefferson's Birthday celebrations are coordinated by community groups, organizations and venues dedicated to the president, such as the Thomas Jefferson Visitor Center at Monticello, near Charlottesville, Virginia. Public ceremonies, leadership awards, educational games for kids and other activities are held on this day. Presidents' Day also honors Jefferson, fellow president George Washington, and other U.S. presidents. Thomas Jefferson's Birthday is a national legal observance in the U.S.